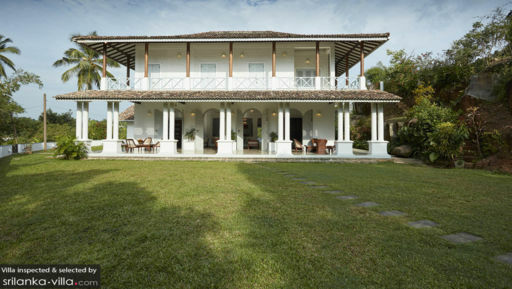 Located in the town of Koggala on the southern coast of Sri Lanka, mere five minutes from the beach, is Villa Pooja Kanda, a quintessential Sri Lankan home with a whitewashed, brick exterior and a red, shingled roof. Featuring courtyards that lead to verdant gardens, five bedrooms with access to the balcony and/or infinity swimming pool, open-plan living and dining areas, and hidden nooks to retire to, the villa is the embodiment of a vacation home perfect for families and groups of friends. With five bedrooms, Villa Pooja Kanda is a great way to have that family vacation you’ve been holding out on. Three of these are found upstairs with access to the terrace, and two including the master bedroom are located on the main level with direct access to the garden and pool. Four bedrooms are furnished with king-sized beds and one with a queen-sized bed, each with a four-poster and mosquito nets to keep these uninvited guests at bay. The air-conditioned bedrooms are spacious and feature vintage furniture including desks, cabinets, wardrobes, and the master bedroom has its own lounge area with comfortable seating. There are en-suite bathrooms accompanying each bedroom. 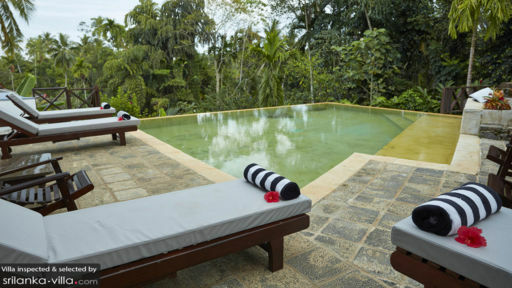 Villa Pooja Kanda is surrounded by lush gardens on all four sides that are manicured to perfection and feature excellent tropical vegetation and even stunning views of acres of flora. Right on the edge hovers the 8-metre swimming pool with its infinity edge, the ideal way to get a grasp on the sheer beauty of the panorama that is laid out in front of you. Just beside the pool is the sun terrace with and alfresco dining area, sun chairs, and loungers for guests to unwind amidst the fresh air and under clear skies. The gardens lead to the open-plan living area which can be accessed via arched doorways with white wooden doors that allow a plentiful view and constant fresh air. The colonial-inspired architecture will take you back in time what with its muted lighting, high ceilings, and long-stemmed fans. The antique wooden furniture and in-built sofa only adds to the image. The floor features a gorgeous woven carpet and the walls are adorned with artwork. The villa houses a media corner with comfortable and plush couched, flat-screen TV, and DVD player. A staircase leads you to another hidden corner that serves as the study space with a writing desk and bookshelf. Besides the alfresco dining area, there is another dining area indoors with an eight-seater dining table so you can combine the two and enjoy a hearty feast with family and friends utilising the entire space available to you. The kitchen is just behind the TV room and is a spacious affair which is fully-equipped with ample amenities and appliances for your use. The villa is fully-staffed with a team including persona guest assistance, housekeeping, pool maintenance, and security. They are there to cater to all your needs without hesitation. You can appoint the chef to prepare scrumptious local and international cuisines for you daily whenever you wish to eat. A breakfast is complimentary to your stay while other meals are at cost of groceries. The staff can even arrange for a BBQ with the freshest of ingredients. Found in a most idyllic location just minutes away from the beach Koggala, Villa Pooja Kanda is the ideal place for a laidback and easygoing holiday with the ones you love. Enjoy the coastline and views of the Indian Ocean as you lie back and rest. Indulge in surrounding nature and discover thriving wildlife found so commonly in this region, and soon you will lose count of the number of mesmerising sunsets you witness. Totally amazing experience. Awesome staff, delicious food, lovely environment. The facility is magnificent. Like living luxurious with a djungle feeling monkies schreeching around the corner. 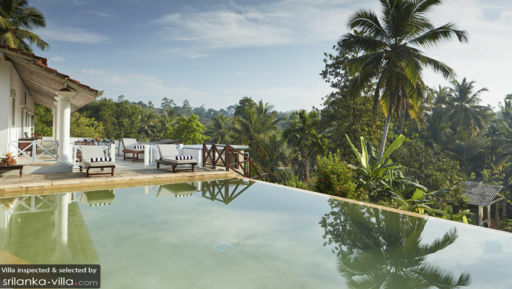 I would suggest anybody visiting Sri Lanka to rent Pooja Kanda a couple of nights. All the best recommendations. We felt very much a part of village life even though we were perched well above the nearly out of sight homes. Loved the early morning chanting,mullahs calls to prayer,drumming,and morning fires. Watched the morning ritual of monkeys crashing through the trees on their way to a day out feeding and watched it all in reverse at dusk. Marvelled at the busy birds of all colours and laughed at the squirrels antics. Pooja Kanda was a paradise for us....lush and floral. The property was beautifully maintained and the staff delightful. We ate delicious Sri Lankan cuisine for breakfast,lunch and dinner. Tell the chef how you like it and give him his head. Can't wait to go back...Cheers Charmaine. We enjoyed it to Pooja Kanda, everything was perfect. The splendid villa, delicious cuisine carefully prepared by the chef and his team. Loku, the supervisor has organized a party for a birthday party with dancers and musicians, fireworks, BBQ, ..... unforgettable. Everything was done for our comfort and we really enjoyed! Thank you to Rob, the manager and his team (supervisor, cooks, gardeners, cleaning lady, Guardians) .... it was a dream for us and you've done! At another time perhaps, but with the kids because I think it will be paradise for them too! Thank you.